The Cacti & Succulent Coloring Book! The Cacti & Succulent Coloring Book - Now a Real Coloring Book! Announcement After months of getting funding secured, I'm proud to let you all know the first round of physical coloring books will be available for ordering in November! I'm very excited to be finally be able to offer a real coloring book for coloring enthusiasts on this site. There may be an option for printing some of the single page designs on thicker watercolor paper. Stay tuned! After months of getting funding secured, I'm proud to let you all know the first round of physical coloring books will be available for ordering in November! The wide and wonderful world of cacti and succulents- now in a coloring book! The world of cacti and succulents is wide and beautiful, as these hardy plants come in wonderful arrays of shapes, sizes, colors, and numbers. From South Africa to North America, these drought-tolerant plants have adapted to arid climates with amazing tenacity. Due to their versatility, low maintenance care, and striking appearance, cacti and succulents are experiencing wild popularity among gardening, interior design, and other creative circles. 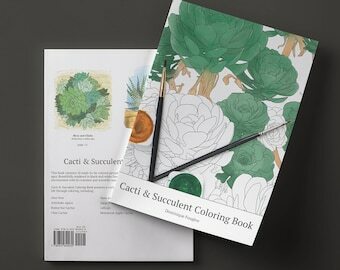 This coloring book for sale on this store is for cacti and succulent enthusiasts to get to know these wonderful plants in their many forms in a relaxing and creative medium. Bring to life these alluring plants with a rainbow of colored pencils, markers, watercolor paints, etc.! If you are dissatisfied with the purchased PDF by any means, please contact me and I will initiate a refund promptly to you.